Up to +4dBm RF transmits power. Low Power 1.8V Operation, 3.3 to 5 V I/O. Auto‐connect to the last device on power as default. Auto‐reconnect in 30 min when disconnected as a result of beyond the range of connection. Bluetooth based Robotic projects using 8051/AVR/PIC/ARM/NXP/Infineon microcontroller. It is used in all types of wireless communication purposes. 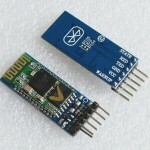 HC-05 Bluetooth Module ChipsetThis is only the chipset not the HC05 Module with ttl interface. ..